How is the Irish revolution at Preston shaping up? Local reporter Dave Seddon chats to The42 about the growing ex-League of Ireland contingent at the club. Daryl Horgan joined Preston from Dundalk last season. EVERY SO OFTEN, in English football, a team crops up with an unusually high number of Irish players that tend to be adopted as many supporters from this island’s ‘second team’. There was the Aston Villa side of the mid-1990s, which at one point, featured Paul McGrath, Steve Staunton, Andy Townsend and Ray Houghton. Later on, there was the Sunderland side with Niall Quinn as owner and Roy Keane as manager, when it felt for a period like every second player the club signed was Irish around the mid 2000s. At the moment, there are two teams that could be put in this category. If you include Jon Walters, who has just moved from Stoke, five of the 11 players who started Ireland’s World Cup qualifier with Austria last month are on the books at Burnley. Meanwhile, the imminent arrival of Sean Maguire and Kevin O’Connor will bring the number of Irish players at Preston to eight. The Championship club will be hoping these new acquisitions can help them build on last season’s progress, when they finished 11th in the league — and it could have been even better. A dreadful start saw Preston pick up just two wins in their opening eight games. However, their form picked up thereafter, and with fans’ player of the season Aiden McGeady in particular producing regular inspiration, they even threatened to push for a spot in the play-offs. However, the unlikely promotion bid ultimately fell short. Their form tailed off again as the campaign came to a close, when they suffered five losses in their last six games. So, since gaining promotion from League One, the club have now finished 11th in the Championship two seasons on the bounce, a very commendable feat given their somewhat limited resources in comparison to a number of the teams around them. Indeed, it is arguably tougher than ever for teams such as Preston to secure promotion to the Premier League. Last season, Sunderland received almost £100 million worth of TV money for finishing bottom of the top flight. Fellow relegated sides Hull and Middlesbrough were given slightly more than that figure. These newly relegated teams will inevitably tend to spend big in an attempt to secure promotion back to the top flight at the first time of asking, leaving less well-resourced sides such as Preston at an immediate disadvantage. And even certain teams that aren’t recently relegated can devote considerable funds towards promotion bids. Last season, a report detailed how the Championship was the fifth-biggest spending league in Europe, eclipsing France’s Ligue 1 among others. This year seems to be a similar story. Wolves, for instance, just paid €18million to sign Porto midfielder Ruben Neves. Nevertheless, with a couple of new signings arriving and a young squad that are improving all the time, there is an optimism at Deepdale that the club can improve on the past two seasons and mount a sustained challenge for promotion this time around. The departure of manager Simon Grayson to Sunderland and the arrival of former Norwich boss Alex Neil has done little to quell this sense of optimism. The Scottish boss, as is the case with Grayson, is someone who likes his sides to play attractive football. They seem to have got a decent fit with Alex Neil or what they wanted,” says Lancashire Evening Post reporter Dave Seddon. “It’s sad to see Grayson go. He offered a lot of stability. He got them promoted, got them very comfortable in the Championship. But now it’s a new era, they’ve got to try to push on. They have a lot of players in their early-to-mid 20s. A lot of players who have points to prove, who have come from a lower level or haven’t quite made it at a higher level. Last season, some pundits suggested Preston were one top-class striker away from being a side capable of challenging for promotion, although their goal tally of 64 was a marked improvement on the previous season’s disappointing return of 45 from 46 games. One man that many will hope can add goals to the side is Sean Maguire, with the Irish striker set to join up with his new teammates on 1 August. With 19 goals for Cork in the League of Ireland this season and a couple more in Europe, Maguire will be hoping to bring this fine form into the Championship, with Preston set to get their campaign underway at home to Sheffield Wednesday on 5 August. Maguire, along with current Cork teammate Kevin O’Connor, is set to link up with their new side imminently, while many Preston fans have kept up with the duo’s progress on the Leesiders’ official Twitter account among other outlets. Maguire comes as the better known of the pair, purely because of the goals he’s been scoring,” adds Seddon. “There’s a lot of attention about the 19 goals and the hat-trick in Europe. North End have cottoned on to that. He was scoring quite a lot before the move was agreed and he’s carried on scoring — it’s pleasing that he’s not taking his foot off the gas. Maguire’s got a good chance of going straight in (to the team). O’Connor’s got very strong competition with Greg Cunningham already at the club at left-back. “Certainly, with Maguire, I don’t think you can call him an unknown quantity with social media and everything. Of course, the duo won’t be the only former League of Ireland players in the Preston squad. Andy Boyle and Daryl Horgan both joined the club from Dundalk last season, with the pair since gradually getting used to their new surroundings. Horgan broke into the side more or less straight away, and made 19 appearances in total last season, though he was in and out of the team towards the end of the campaign, coming off the bench at times rather than starting games. Boyle, meanwhile, didn’t start his first Championship game until a 1-1 draw with Derby in March, going on to make seven appearances in total for Preston last season. You could say Horgan has settled better given the fact that he’s got more appearances,” Seddon explains. Horgan may see his game time extended next season, particularly with the club set to fail in their bid to bring Everton’s Aiden McGeady back for a second season-long loan. 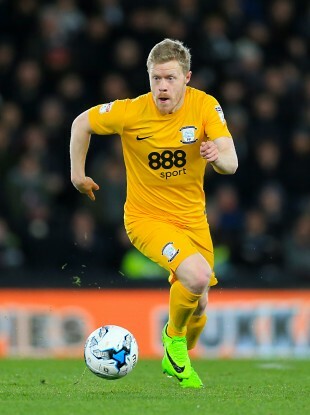 The Irish international was superb for Preston last season, but now appears set to join Grayson at Sunderland, with the Black Cats having a level of financial support that their Championship rivals simply cannot match. (McGeady) was superb here last season, such quick feet to create that little bit of space to make things happen,” Seddon recalls. “He’s a massive loss. “Sometimes, it shows the gulf of what players are earning in the Premier League and what they’re earning in the Championship. “(Preston have) signed a lad called Josh Harrop from Man United. He’s a similar sort of number 10 player who can play off the frontman or on either wing. Alan Browne, Greg Cunningham and Eoin Doyle complete the Irish contingent at the club. Both Cunningham and Browne are performing well currently. Cunningham was player of the year after the 2015-16 campaign, while Seddon adds that he was “probably top three or four last year,” before a fracture to his tibia curtailed the Galway native’s season prematurely in April. In addition, Browne, another former Cork City player, albeit one who never featured at senior level for the Leesiders, is still only 22, and made 31 Championship appearances in total for Preston last season. Doyle, on the other hand, appears to be on his way out of the club. He spent part of last season on loan at Portsmouth, who gained promotion to League One at the end of the campaign. New Wigan boss Paul Cook, who Doyle played under at both Sligo and Pompey, could link up with the striker again if recent reports are to be believed. Doyle has had a frustrating time in his two seasons so far with Preston, registering just five goals in the Championship, while he was sent off along with team-mate Jermaine Beckford, after an on-field fight broke out between the pair last December. Perhaps unsurprisingly, the 29-year-old has made just two appearances for the club since then. In terms of the season ahead, an automatic promotion spot seems a tough ask for Preston, but with one or two more signings before the deadline, Seddon believes they are good enough to challenge for the play-offs. While there are teams in the league with greater financial resources, Preson will be hoping to be this year’s equivalent of Huddersfield, who seriously punched above their weight to reach the play-offs and subsequently gain entry to the Premier League under German boss David Wagner in the 2016-17 campaign. Huddersfield have opened that door. (Clubs) don’t need to spend millions and millions. They got (into the Championship) three years earlier than Preston did. When Simon Grayson was manager of Huddersfield, he got them out of League One and then stayed with North End for three years. “Huddersfield were three years ahead of Preston and they struggled quite badly the first couple of years, but then went for something a little bit different with Wagner and they spent a little bit of money, but not as much as Villa and teams like that. So Huddersfield have shown it can be done on a more limited budget. Email “How is the Irish revolution at Preston shaping up?”. Feedback on “How is the Irish revolution at Preston shaping up?”.